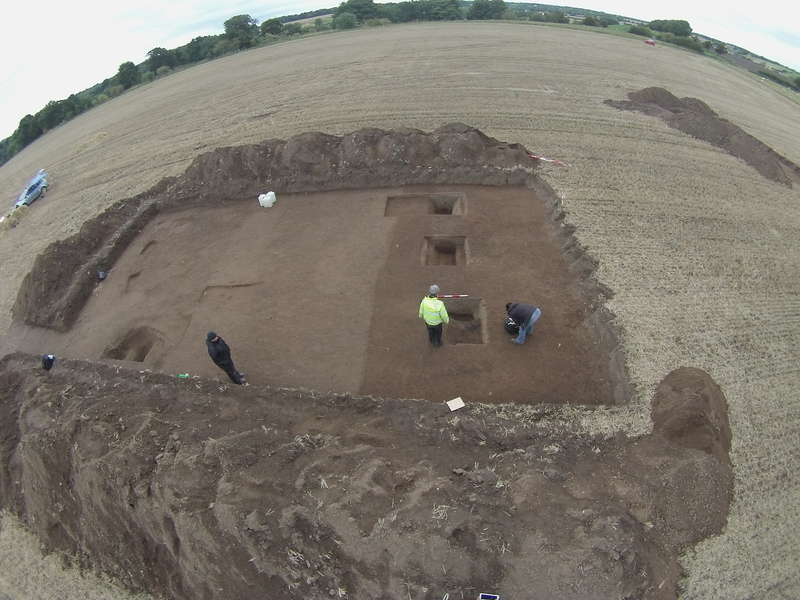 Penultimate day for the excavation. Of the 4 + 1 trenches we initially opened, all but one have been subject to investigation. 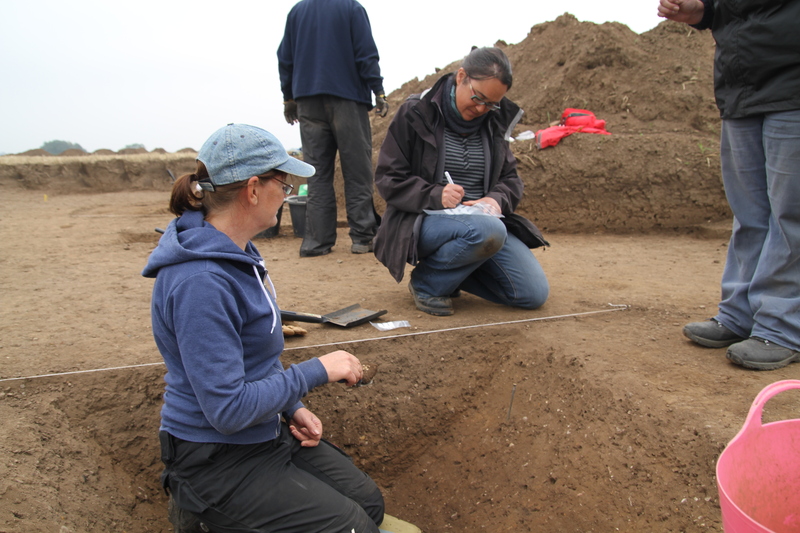 Trench 1 is in the final stages of recording, We have the titula/titulus/titulum pick your poison, sectioned, as well as the east terminal of the main ditch at the north entrance to the marching camp. 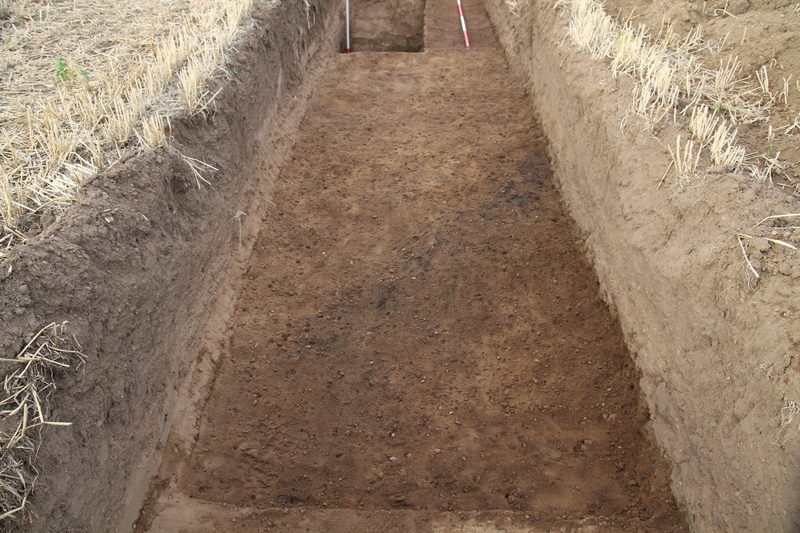 A conundrum that has been bothering us all since the early clean up phase of Trench 1 is a linear feature some 1.5 m wide that runs across the full extent of the trench and is parallel with the camp entrance, but between the entrance and the titula, there is some evidence from the magnetometer survey of a linear feature that straddles the front of the camp entrance behind the titula. When trying to understand the geology on the site Brian Dale the landowner advises that generally across the farm there is a 50mm lens of hard compacted sand and gravel below the top soil, above looser predominately sand and gravel subsoil, this was the evidence we were presented with on opening up the site across all of the trenches. The surface of the linear feature conformed to what we initially believed to be natural geology. 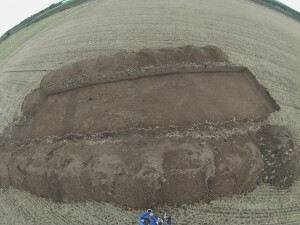 The evidence is however starting to mount up that whilst this hard lens may well be of the same material and texture as that which generally overlies the sand and gravels where there is no archaeology , it is is becoming apparent that it is also appears to be reforming over archaeological deposits over a given timescale through settlement of material from the deep topsoil. 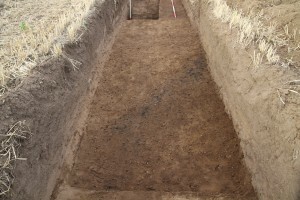 Trench 1 Linear feature running left right across trench in front of camp entrance bit behind titula. 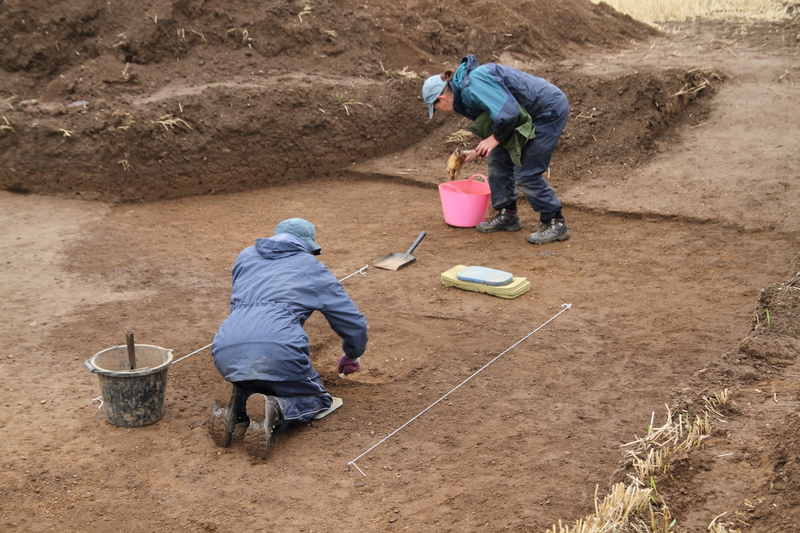 Trench 2 is also approaching completion, the section across the ditch that forms the subdivision of the marching camp has been fully sectioned and conforms to standard roman ‘V’ shape with ankle breaker, although to a lesser scale than the marching camp ditch. 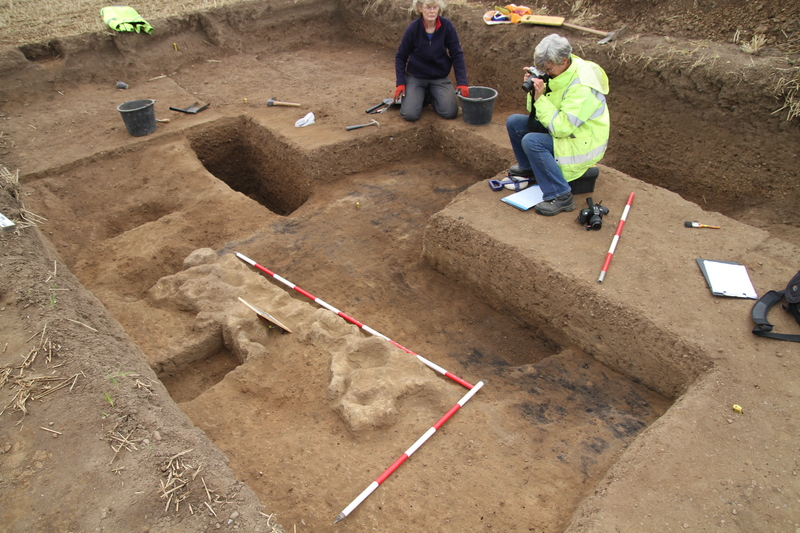 Removal of some of the burnt sculptured sand has revealed what appears to be an extensive area of what appears to be carbon deposits, although including the ubiquitous rotting and delaminating black shale found extensively in every trench. Trench 2 Gordon getting his ankle into the ankle breaker in the ditch of the marching camp subdivision. 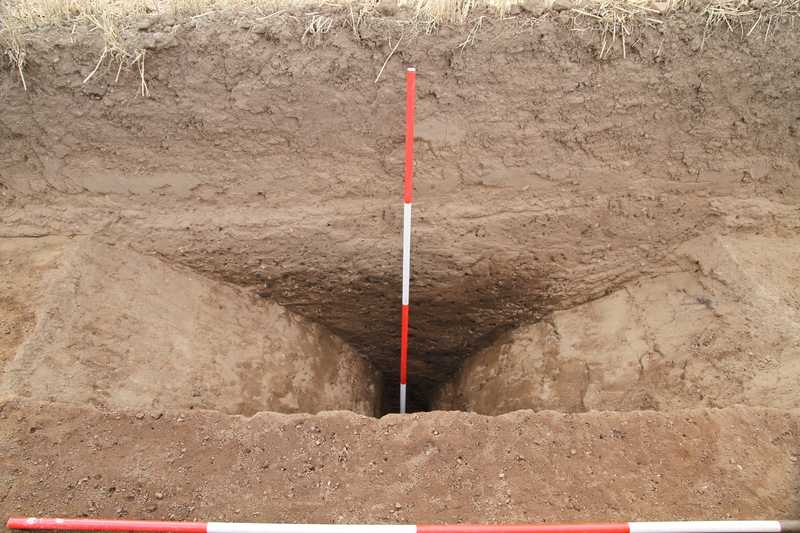 This trench although opened up and cleaned has not been excavated, Due to an error on my part in transposing the trenches from an ungridded survey to a gridded survey to aid measuring the trenches in, I accidentally located the trench a few metres to the west of the original plan. Although the trench still captured the road ditch? 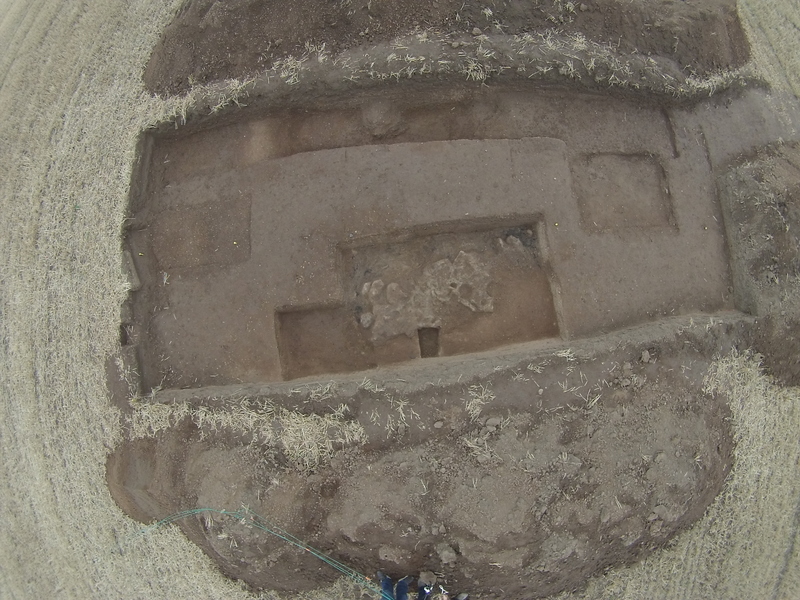 that ran East/west across the site, it missed a circular feature we were interested in. However by accident we have potentially located far more important evidence of later settlement activity on the site, with two sides of a rectangular timber framed? building with an internal division. 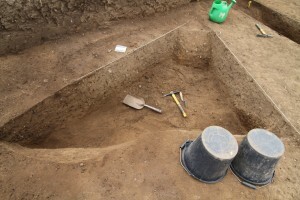 Of even more interest the building cuts through an earlier curved feature, and is itself cut through by the road ditch that was the original purpose of opening up the trench. Perhaps I should claim divine intervention for my mistake. Anyway a prime candidate for work next year. Excavating still in full flow, ditch we thought was some sort of foundation ditch for a rectangular building from the mag has turned out to be way too big for a foundation trench. At 20m long by 10m wide, we must now expect to potentially have a structure inside it. Possible candidate for next year. Trench 4 Big ditches, busy, busy bees. This was the trench excavated some 30m east of the main gate with the aim of identifying a clean section of the main marching camp ditch away from the main gate. unfortunately it was just as hard to locate and identify the feature here. Eventual technique required to identify the ditch was to remove 25m of the hard sand and gravel lens across the whole trench, and keep doing it until the feature appeared. 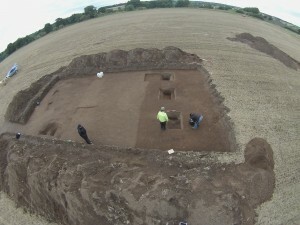 It required the removal of 75mm of material before at last we could seperate the natural from the archaeology. 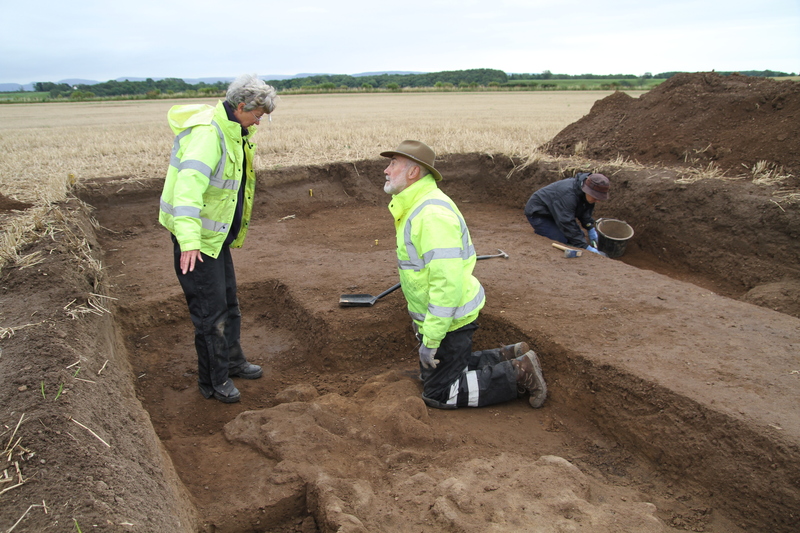 The ditch was fully excavated with no finds, it is 2.4m wide and 2.1m deep from the current ground surface to the bottom of the ankle breaker, and 1.4m from the bottom of the topsoil. 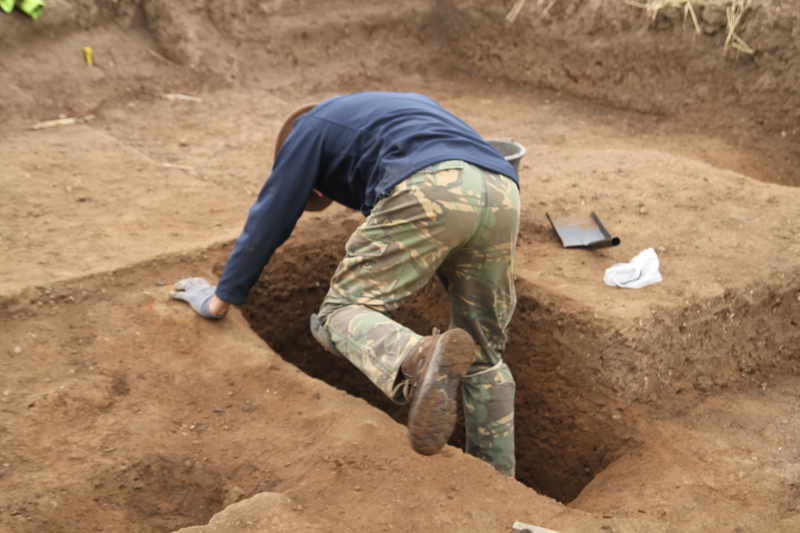 On the inside of the ditch there is a textual change suggestive of the remains of the bank which unfortunately extends outside the limits of our trench. A further feature found on the final clean down before photography was a ditch running across the bank at an angle with a burnt edge on one side. Weather today cool, overcast, shame about the wind drying out the sand and gravels. Fortunately the rain we have had over the last few days has softened the ground once the surface crust has been scraped away. 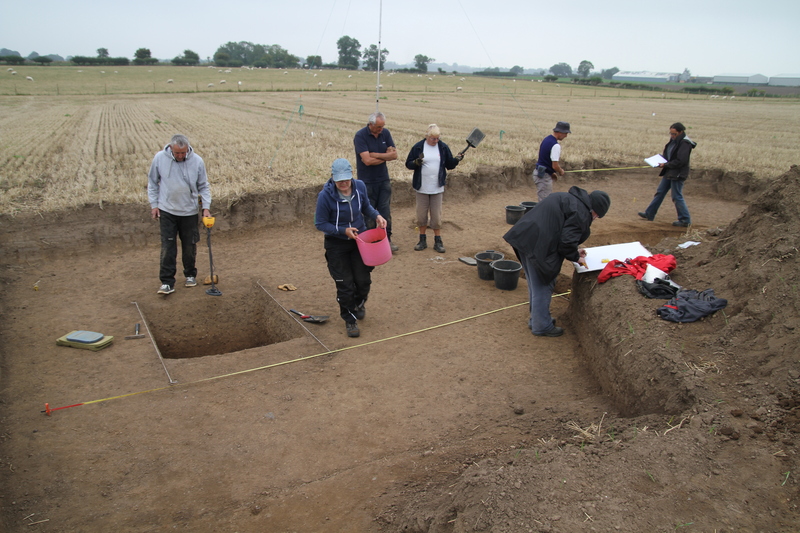 Have to say a few words about the diggers, despite the bad weather at times, most have been here throughout the dig in fair weather and foul, with a few dipping in and out. 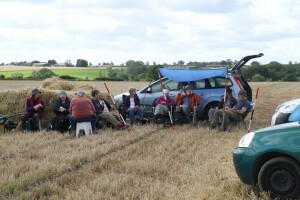 Top team at digging, good teamworking and cracking social company. 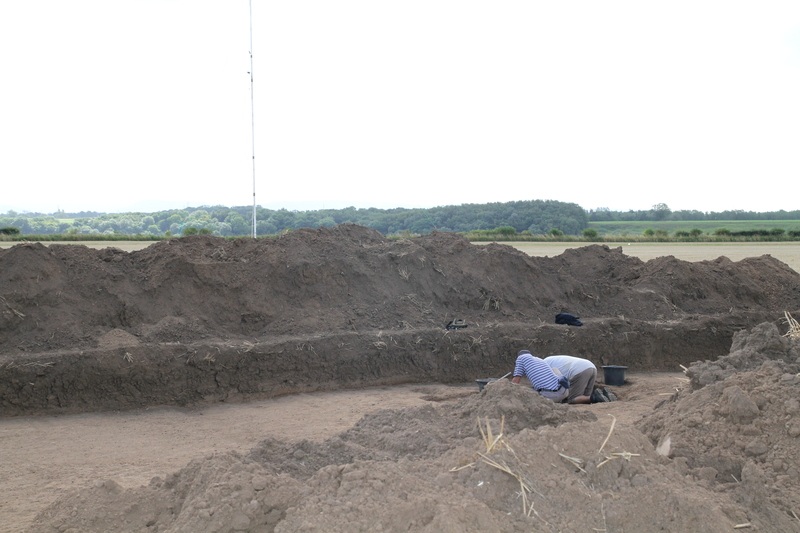 Trench 1 and Trench 2 are now in the recording and photographing phase. 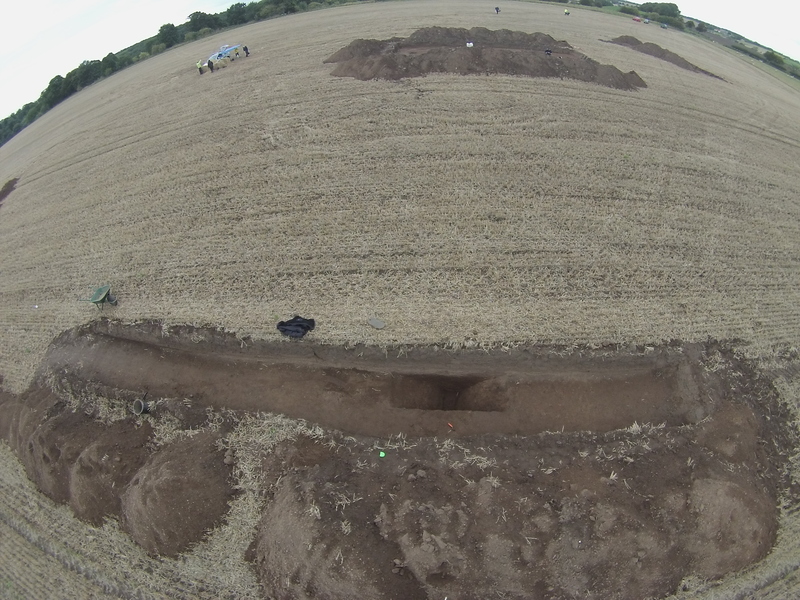 Being ahead of the game we have decided to section the ditch feature in Trench 4. 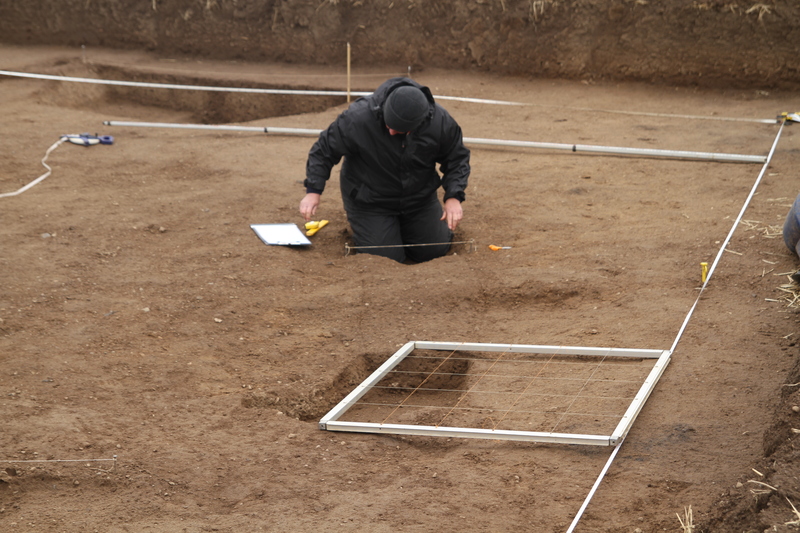 Trench 4 was targeted at a 20m x 10 rectangular feature and one that showed up clearly on crop marks and the magnetometer survey, postulating that this feature may well provide evidence for Roman or early medieval civilian settlement on the site. 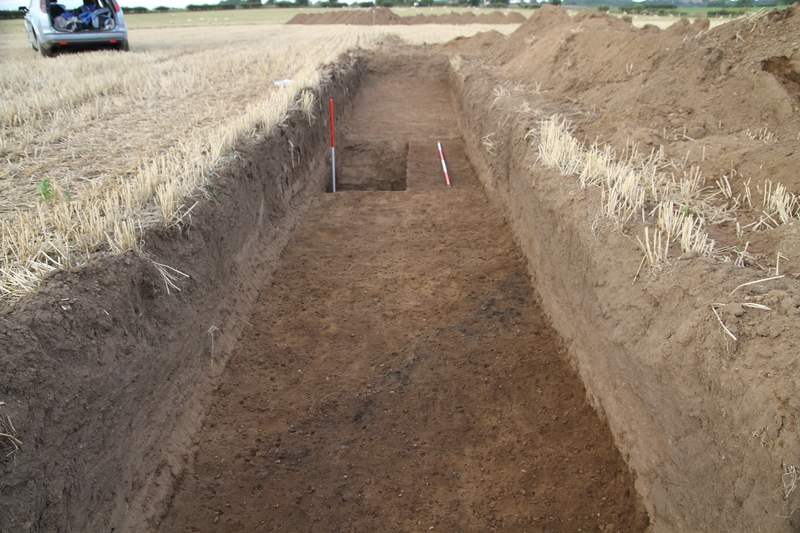 The trench takes in half of the long side of the north ditch and part of the short east end including the corner. Finds in the two sections opened today include decorated Samian, Black Burnished ware and greyware, indicative of a possible 1st to 4th century range., additionally a copper pin head was also taken from the ditch. 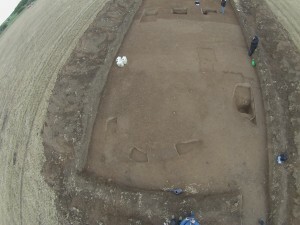 The Trench 5 excavation some 30m east of the gate was also completed today. This unplanned trench was opened to offer an second main ditch section to the confusing archaeology in Trench 1. 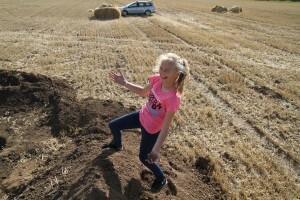 The ditch is 2.4m wide and 2.1m from the current ground surface to the bottom of the ankle breaker, and 1.4m from the top of the sub soil to the bottom of the ankle breaker. 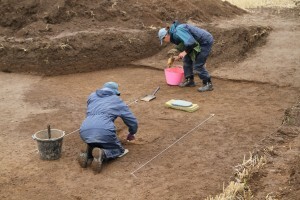 Behind the ditch there is also some evidence from a textual change of the remains of the bank. 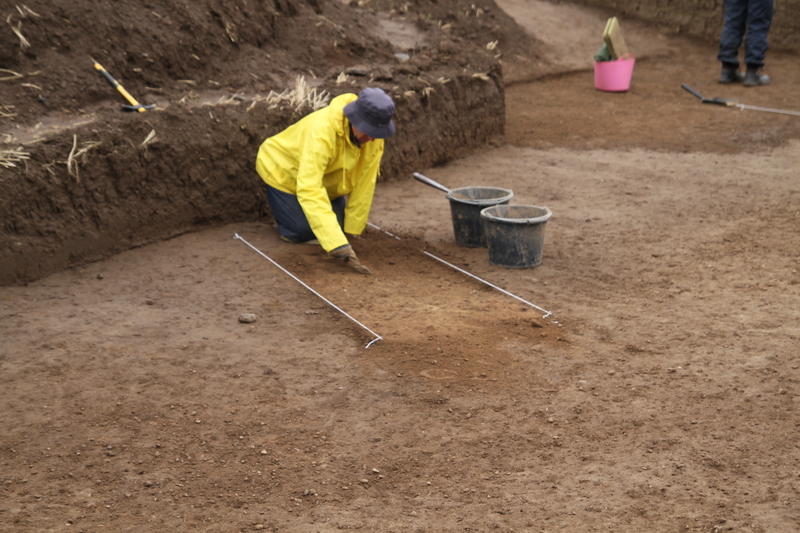 On cleaning up the trench after completing the ditch, another ditch was evident running at an angle across Trench 5, interestingly with a black apparently burnt edge on one side, but not the other. 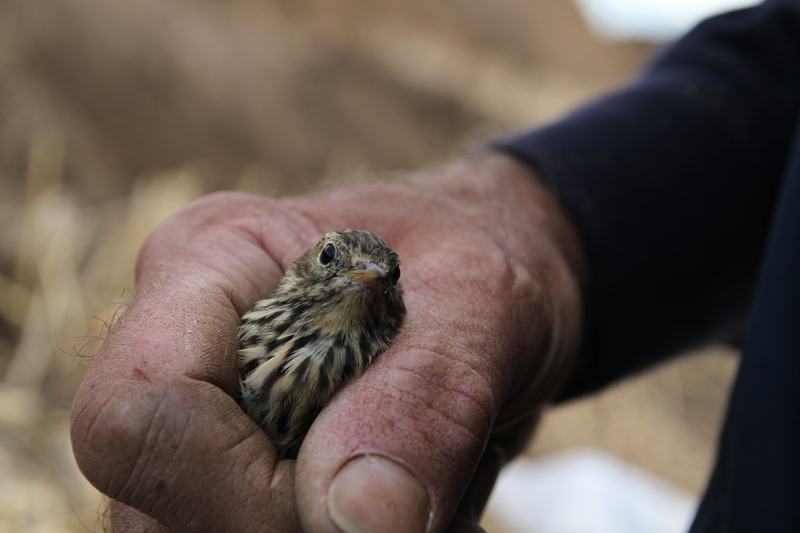 Working on to complete the cleaning of Trench 5 after the others had left for the day, in the silence I heard a strange sound, climbing out of my 7ft hole I eventually found a bird had flown into my adjacent car and was banging its head against the windscreen trying to get out. anybody know what type of bird it is. A key element of this excavation is our intention to maximise the use of modern camera technology to record as much as possible of the process. 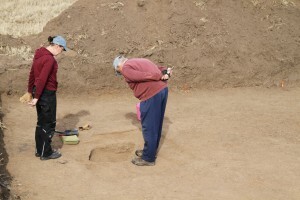 Of course imagery has long been a staple element of archaeological investigations, but more often than not they are staged images at a particular point in the excavation for the report and the archive. Until recently because of the expense the only alternative to still images was relatively low quality video recording, however recording 10 days of excavation, some 70 hours of video in total, especially with the excavating process making a can of Dulux Brilliant White drying on the wall exciting, would drive the average teetotaller to reach for the sauce. We decided to utilise three elements, 1080p High Definition wide angle lens sports cameras, 1080p High definition digital single lens reflex cameras(DSLR), and fixed lens devices such as phones and tablets. 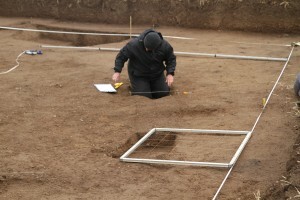 In order to record the excavation using a method that made it watchable and usable, instead of recording standard video at 30 frames a second , which would use horrendous amounts of storage and be totally impractical, we decided to use time lapse extensively at the rate of 1 frame every 5 second. Time lapse unlike video is actually a series on individual high definition images, each of these images in their own right can be accessed in exactly the same way as a standard DLSR camera image. This method gives us 25000 HD images per day some 250000 over the course of our 10 day excavation. The final element is the use of a 7m mast to hang the camera on, this gives us the benefit of effectively low level aerial photography. During the course of the excavation we have positioned the 7m mast to record the whole excavation of Trench 1 in time lapse, and are currently recording the excavation of Trench 4 in time lapse. The results so far have been very encouraging features that were not seen on the ground after cleaning down the trench are clear in our overhead. 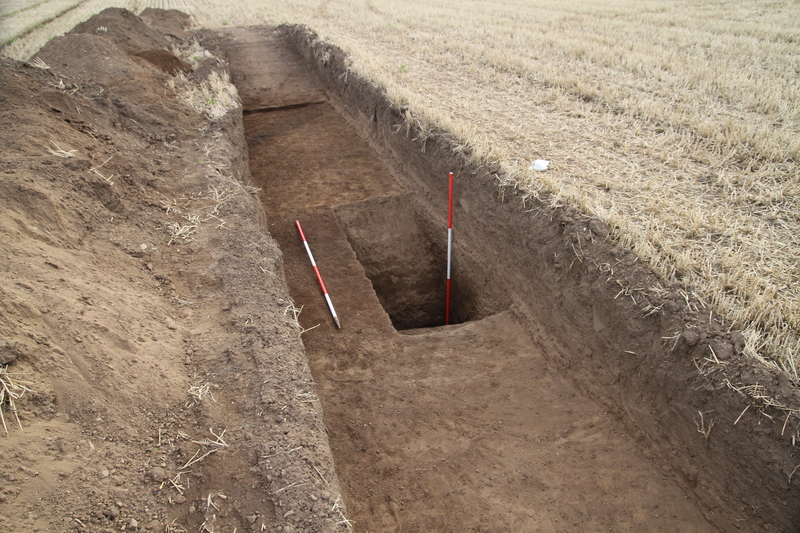 The following image shows the ditch we found on opening up Trench 3, but more importantly is shows two sides of a rectangular feature with an internal division, and also shows a curved feature. 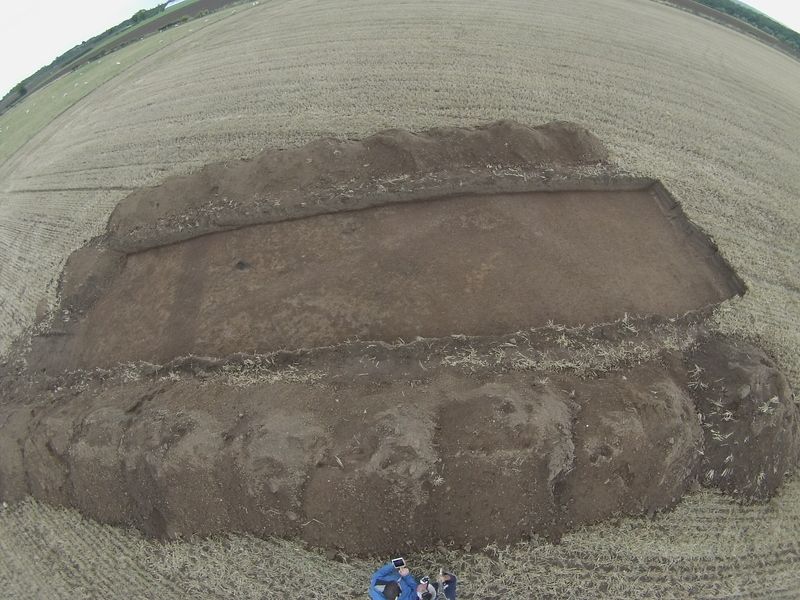 The most interesting element is that 3 phases of activity in the trench are clearly visible as the rectangular feature cuts through the curved feature and the dark ditch cuts through the rectangular feature. A touch behind with the photo processing tonight , so I am posting an interesting piece of research I carried out recently on the possible crossing points of Cades Road. 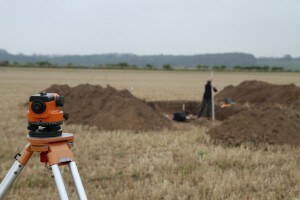 The idea behind the research was to investigate known historical structures in the river, with a view to investigating whether they were possibly being built on earlier foundations. 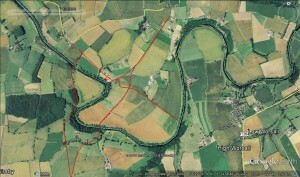 I have been doing some research on trying to narrow down the area to look at as starting points to focus on from the 7km stretch of the river from Low Middleton Ford to Worsall Wath. Obviously we know all the various fords crossing the river, which I have no doubt were used extensively simply because they were the furthest downstream crossing points for any North/South journey. However to validate our argument for Cades Road being a strategic road, it is inconceivable that a permanent all weather crossing point was absent from the route as it crossed the Tees. My research to date points to a number of likely anomalies that could point to a crossing, with in my opinion the most likely area being to the south of the marching camp/settlement in the vicinity of Fardeanside Ford. “The informac’on of Francis Bunney, of Little Newsam, in the county of Durham, joyner, taken upon oath before William Blakiston, Esq. and John Morland, Esq. two of his Majties Justices of the Peace for the said county, the twenty-eighth day of September, Anno xxxiiio Caroli Sc’di. Who informeth, that on or about the last day of August last past, one Mathew White, of Ovington, in the county of Yorke, yeom’, came to this Informant, and did, in the name of William Bowes, of Streatlam Castle, in the county of Durham, Esq. desire him this informant to goe with him and others to aid and assist in pulling downe a dam upon the river of Tease, called ffish Garth Dam, in the parish of Eggscliffe, in the said county of Durham; and at the instance of the said White, he this Informant did promise to meet him upon the beet of a drume, which he told this Informant would be beet to call the people together; and that, according to his p’mise, upon ffriday the first day of September instant, heareing the beet of drum, he did depart from his dwelling house at Little Newsham(my comment, no relation to our Newsham) aforesaid. In his way to Pearce-bridge he overtooke and came unto the company of the said White and others, to the number of thirty or thereabouts, whose names, or so many of them as he knowes, are hereafter discovered. And soe soon as he came to them, he travelled with them till such time as the said White desired him to ride on and stay some other p’sons that were before to joyne with them in the same designe; whereat he this Informant rode before, and found twenty p’sons more, or thereabouts, at Pearce-bridge, whome this Informant desired to remaine there till the said White and his company came up. That as soon as the said White and his company came to Pearce-bridge aforesaid, they, together with this Informant, and the other twenty, or thereabouts, did goe from Pearce-bridge to the said ffish Garth; and in their way thither there came to their aid ten more, or thereabouts; that at Neasham, in their way towards the said ffishgarth, one Mr. Henry Chaytor, of Croft, in the county of Yorke aforesaid, and one Mr. Killinghall, whose place of abode he knowes not (fn. 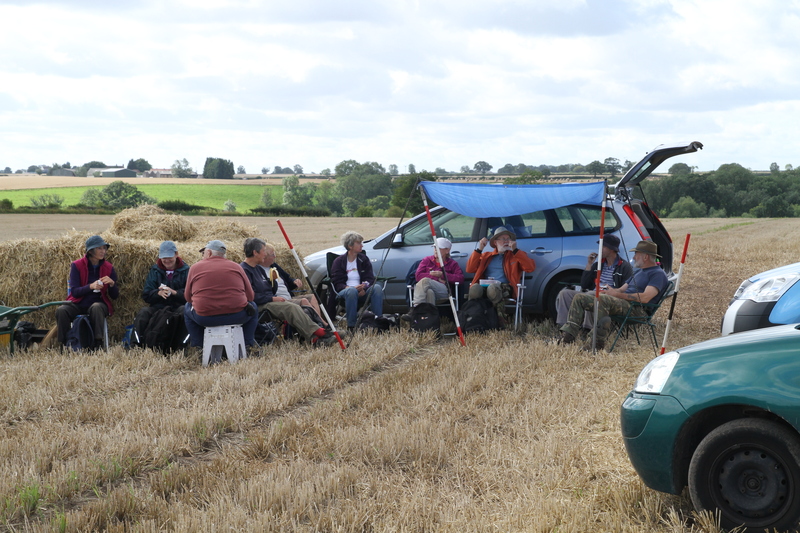 75), did call for ale, and drunk Esqe Bowes’ health, and afterwards gave six shillings to them, to be by them spent in drink, which they did drinke, the drum beating, and they shouting and hooping, A Bowes! A Bowes! And from thence they went to the said ffish Garth, and there he this Informant, together with the said White, and Robert Cuthbertson, of Barnard Castle, in the said county of Durham, drum’er; Robert Baxter, of the same, in the said county, laborer; John Shutt, of Whorleton, in the said county, yeom’; William Rowntree, of the same, yeom’; Christopher Shutt, of the same, yeom’; John Yarker, of the same, yeom’; Anthony Richardson, of Staindrope, in the said county, cordwainer; James Wild, of Raby, in the said county, millwright; George Speck, of the same, yeom’; George Bailes, of Wakerfield, in the said county, millwright; John Parcivall, of Gainford, in the said county, yeom’; — Parcivell, of the same, yeom’, and the miller of Upper Conscliffe; John Huggiston, of Ovington, in the said county of Yorke, yeom’; ffrancis Newton, of the same, yeom’; with eighteen more out of the said county of Yorke, and divers others out of the said county of Durham, whose names he knowes not, did pull up and breake down, with sawes and axes, soe much of the said dame as they could, and, if not p’vented by the height of the water, they would have pulled downe the whole. And he this Informant was induced thereunto, for that the said White did assure this Informant he had a letter from the said Mr. Bowes, to be left with Mr. Witham, at Sledwish, to be sent into the high lands, to get the said Mr. Bowes’ tenants, and as many more as they could, to goe along with them, and that all their charges should he defrayed and borne. And he further told him, that Mr. Bowes was gone another way, and would meet them; but that he this Informant did not see the said Mr. Bowes, nor had his charges, or heard of any that had them borne. And he further saith, that the said Cuthbertson did frequently beet the drum all the way on their journey; and that all or most of the said p’sons were armed with guns, pistols, swords, and other offensive weapons. 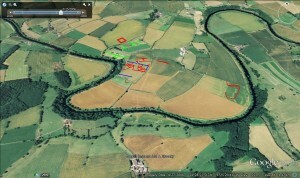 I have trawled through the documentary evidence looking for Fish Garth Dam and the adjacent Fishgarth Farm (Christopher Kings dwelling house)that is mentioned, and had the best results using the 1840 Tithe map and apportionments. Reviewing the whole of Egglescliffe parish I came up with no Fishgarths in the Egglescliffe township, four fields called Fishgarth in the Aislaby township,(550,551,552,553) and four fields called respectively Fishgarth(555), South Fish Garth(575), North Fishgarth (576) and Fishgarth (578) in Newsham township. 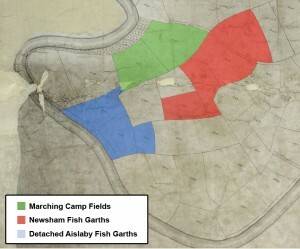 I immediately assumed there must have been two fishgarths at some time complicating the search, however on consulting the tithe map, I found that the four Aislaby Fishgarth fields together make a parcel of land that mirrors nearly identically a detached parcel of Aislaby land to the south of our marching camp/settlement site and abutting the river, and the four Newsham Fisgarths are immediately to the north of the marching camp settlement site, potentially at or about the site of said Fishgarth Farm?. 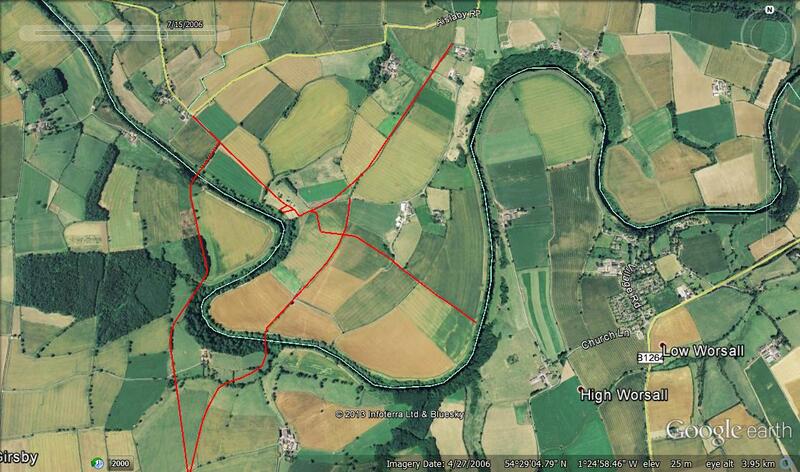 I have attached a tithe map with relevant Fishgarth areas marked out. This research of course does not ignore the possibility that no reference survives to the site of the 1673 dam, however having eight Fishgarth names surrounding our main site, has to be worthy of further research. Obviously this is all circumstantial, although in the absence of signs telling us ‘No Diving off the Dam’, or ‘Day Fishing licences, only 1 groat’ being found discarded in the hedgerow, we have to work with what we have. The Fishgarth dam in question in 1673 was presumably causing the same sort of problems for migratory fish as the current Tees barrage does with the same complaints, although more proactively made presumably because the structure was too high and substantial for the fish to pass. The Aislaby Fishgarths in Newsham take up all the detached Aislaby land in Newsham, and is just too much of a co-incidence for them not to be linked in some way. Detached parish lands are thought to be an anomaly of the ecclesiastical parish rather than the later civil parish, potentially taking whatever structure was in and abutting the river at this point back into the feudal period 9th to 15th century, and who know’s how earlier. The Term ‘garth’ is of course Anglo-Scandanavian in itself. 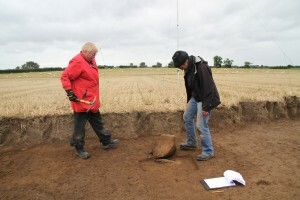 In a nutshell we have potential evidence for a structure in the Tees that at least had a substantial wooden superstructure in 1673, which was only partially removed due to the depth of the water at the time. The named Aislaby Fishgarth detached parish fields in Newsham have as their western boundary the hedgeline we have postulated as the route of Cades road. Assuming said dam respected the existence and continued use of Fardeanside ford, I would expect any dam to follow the method adopted at Low Middleton, where the ford is about 100m downstream of the weir structure, maintaining the integrity of the ford as a crossing point whilst also giving shallow access for whatever method was used to trap fish against the dam. Good day on site. 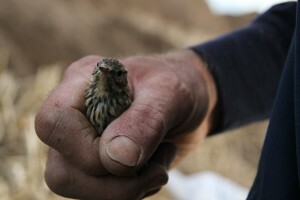 weather held until knocking off time, and then at 4.30 the heavens opened with rain and hail. August Bank holiday Monday dawns damp and wet, perhaps the gods of archaeology are looking down sympathetically on the bunch of sand and gravel shovellers in Newsham. Optimistic the rain will bring resolution of some present but hiding features. 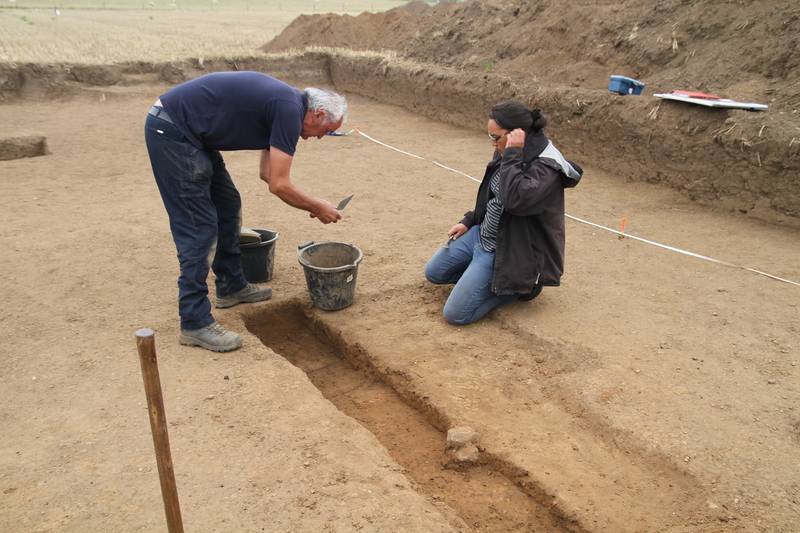 First stop Trench 4 where we have placed our trench to section a long side of a rectangular feature. 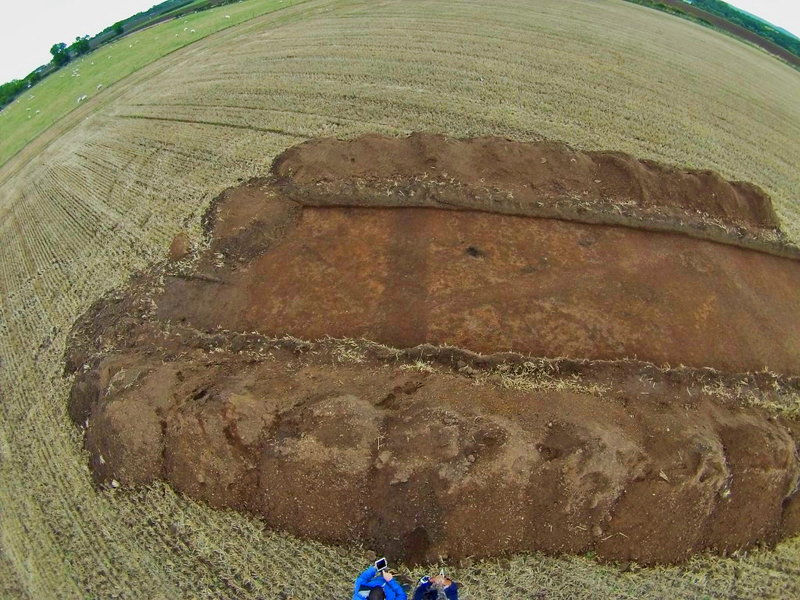 In the dampened trench our previously absent feature is now sticking out like a sore thumb, we can even see a return. It is noteworthy however that the fills of ditches on this site even when wet are barely a couple of shades different from the natural. Here are a few plans of the site and the general project. A decision was made at the digger stage when it became clear that the geology would be causing us problems to open up an extra trench across the camp north ditch away from the entrance to provide for a second opportunity if one was required to record a clean section. Again the ditch did not present well in this trench either, and it was necessary to hand trowel away a 5 metre strip of the ditch 25mm at a time , requiring the removal of 75mm before the ditch edges popped out. The ditch is 2.40 metres wide, and first impressions suggest the edge is a narrow band of fine sand probably from erosion of the ditch from the very beginning, sandwiched between the natural sand and gravels and the more denser fill. 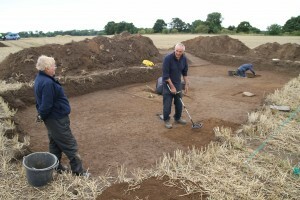 The motley crew, a fine bunch of amateur archaeologists.